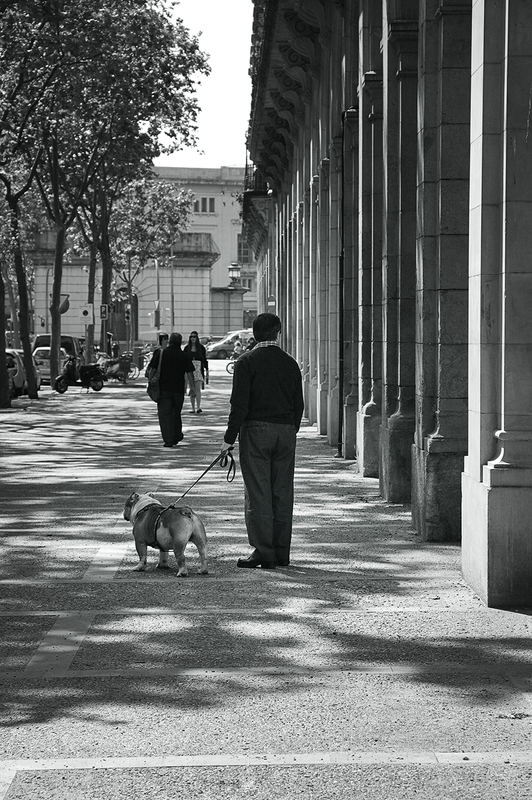 In a quiet morning, under the plane trees, along the archways of Passeig Picasso in Barcelona, there goes a man with a dog. The dog contemplating the entrance to Ciutadella Park at the end of the road longing for that daily walk, the man distracted by some shop window to his right. Probably the same scene could have taken place back in 1888 when the Parc de la Ciutadella and some buildings in the area were built for the World Exhibition. With a little touch of imagination of course. The women in the background of this photo have to be the same two in the June 25th photo. However did you manage that? Ahaha you are right Ian. Keen observation! I didn't realize that myself but I do remember seeing them somewhere along my particular photo walk. The fact they appear in the picture twice is merely accidental. I cannot go around taking pictures daily so I combine different days if possible. In this case it was the same walk. The area has a lot to offer when it comes to street photography. Thanks for pointing that out! I was surprised at the number of dogs I such an urban setting. I just discovered your blog, Carlos. It is wonderful. I will visit often. Thanks for transporting me to another time and place, at least for a little while! I love the morning light, and the black and white. I really like the monochrome feel! nice snap!